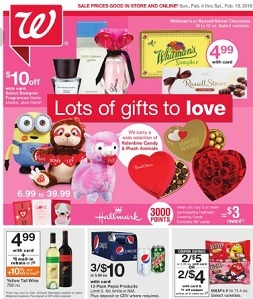 Walgreens Weekly Ad Sale, valid April 14 – April 20, 2019: $10 off Select Designer Fragrances Items; $6.99 to $39.99 Valentine Candy & Plush Animals; 2/$5 M&M’s; B1G1 free Finest Nutrition Vitamins and Supplements; B1G1 50% off Bayer or Aleve Pain Relief; $4.99 Paper Products; 2/$6 Hershey’s Valentine Candy; 2/$7 Chocolate Almond Roca, DeMet’s, Ferrero, Ghirardelli, Godiva, Lindt or Merci; B1G1 50% off Valentine Exchange Candy Kits; $12.99 Squishmallows Plush 8 to 16 in. ; 2/$7 Chocolate Almond Roca, DeMet’s, Ferrero, Ghirardelli, Godiva, Lindt or Merci; $19.99 Valentine Plush Stuffed Animals; 2/$4 Nice! Dried Fruit; B1G1 50% off Nice! Select Nuts; 2/$5 Kellogg’s, Kashi or Quaker Snacks; $.79 Hershey’s or Milka Candy; 2/$4 Ocean Spray Juice; 2/$6 Blue Diamond Almonds; 2/$4 Starbucks Double Shot; 2/$8 Oscar Mayer Bacon; and more. Find all deals and offers in the latest Walgreens/Duane Reade Weekly Ad for your local store.